Spray foam horizontally and vertically with the help of a pressure washer! Foam, foam, and even more foam is what you will receive when washing with the DI Accessories Foam Cannon! When you touch your paint, even when washing, you are at risk of adding imperfections. You can however cut down this risk greatly by using high quality products and detailing techniques. With the DI Foam Cannon and your pressure washer, you can spray a thick layer of shampoo foam onto the surface, which encapsulates dirt and grime, gently pulling it away from your paint and lubricating the surface for safe removal. Pour your favorite shampoo in the reservoir, connect to your pressure washer and start spraying foam onto the exterior. It is really that simple and you will be amazed when people look on as you coat your vehicle in thick fluffy foam! The Adjustable chemical injection knob allows you to adjust how much shampoo you are using, controlling the thickness of foam you are spraying. What makes the DI Foam Cannon different than other Foam Cannons or Lances you ask? Well, have you ever been able to adjust your spray pattern to a vertical AND horizontal direction? With this Foam Lance you can not only do that, but do it while using the unit under pressure! This Foam Cannon also features adjustable fan blades, 1.8 - 5.3 GPM, and it can be used with a pressure washer from 1,100 - 5,000 PSI. The unique spraying patterns help you spray under vehicles, on top of vehicles, on your house, fence, other hard to reach areas around the house, etc. It is an extremely versatile cleaning tool! If you own a pressure washer and want to take your washing to the next level, pick up the DI Accessories Foam Cannon! Includes the DI Accessories 1.1 MM Orifice for Low Pressure Washers. Note: The Foam Cannon, DI Accessories Featherweight Foam Cannon and DI Accessories Foam Lance are designed to work with majority of pressure washers, including Karcher units. If you have a Karcher you may need to pick up the DI Accessories Karcher K Series Foam Lance Fitting for a seamless fit. If you do not have a Karcher pressure washer, the DI Accessories Speedy Super Foamer is also a great choice! 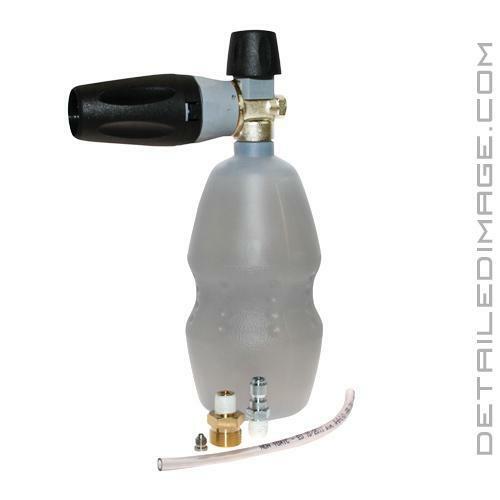 If you are you looking to spray foam vertically AND horizontally with one unit, stick with the DI Accessories Foam Cannon! This is without question the BEST foam cannon in the Detailing industry. I would recommend this to anyone wanting great amounts of "shaving cream" foam!! Way better than the old school foam cannons!! They last awhile as well as long as maintained properly and not dropped too much. And we all drop them! They stand up better unlike the old tall skinny bottle style. Awesome product. Very well made and durable. I love using this thing, and you can adjust it by how much you want your soap/water ratio to be along with being able to adjust it to spray long ways or sideways. Perfect product!